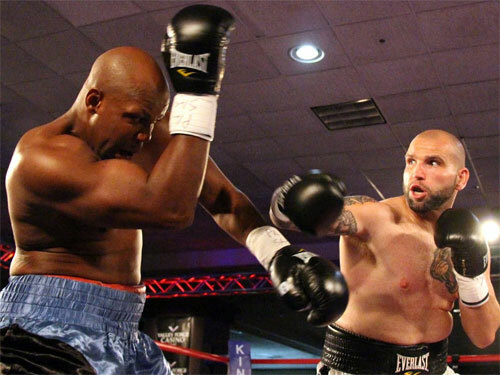 Reading, PA heavyweight Travis Kauffman, lumbered his way to an 8-round unanimous decision victory over Aaron Lyons of Gulfport, MS, at the Valley Forge Casino in King of Prussia, PA Friday night. Lyons came to fight, and pressed much of the action in the slowly-paced bout, but Kauffman, ranked #13 by the WBA, seemed to have all the answers in the fight. After a close opening round, Kauffman began landing heavy punches in round two, chopping away at Lyons in an attempt for an early win. Although he wobbled from the assault, Lyons held steady and fought back hard. However, Kauffman kept the lead with his better rings skills and eight-pound weight advantage. 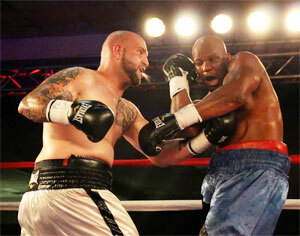 Lyons wanted the victory and continued to try, but consistently fell short in round after round. As the fight reached the midpoint, the fighters began to tire and the fight became clumsy. But the pattern of the fight remained constant. Throughout the entire bout, Lyons pressed the action, landed occasional shots, but Kauffman scored a bit more and maintained control of the fight. It was an honest effort by both boxers, but the result in the ring was rather dull. After eight full rounds, all three official judges scored the bout for Kauffman. David Braswell, who scored it 80-72, felt Kauffman had won every round. Alan Rubenstein had it 78-74 (6-2 in rounds), while George Hill saw it the closest at 77-75 (5 rounds to 3). My score echoed Braswell's at 80-72. After the fight, Kauffman explained that he had gone on a crash course to get himself ready for the fight. "I fought my best being that I lost 30 pounds in five and a half weeks," Kauffman said. "I felt weak, but got the win and that's all that matters." 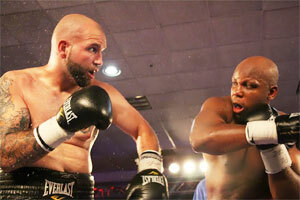 Kauffman raised his record to 25-1, 18 KOs with the win. Lyons fell below .500 at 12-13-1, 9 KOs. 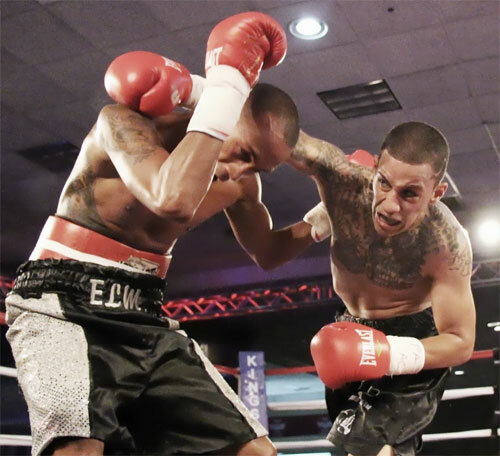 In the 6-round semi-windup, Frank Santos De Alba fought off a pesky and seemingly refreshed Luis "Smurf" Esquilin, to take a unanimous points win in the bout. Esquilin, of Philadelphia, came out swinging in round one. He charged across the ring and peppered De Alba, of Reading, with solid punches. However, once the action settled into a groove, it was De Alba who had the edge. But it wasn't easy. De Alba began round two as the aggressor, rushing Smurf from the opening bell and working to change the momentum after Esquilin's good first three minutes. The exchanges were two-way in the round with both fighters landing well. Toward the end of the round, Smurf's braided hair, which was gathered with surgical tape began coming loose and had to be re-styled a few times throughout the bout. In round three, they traded bombs. The fight was close. But at this point, De Alba's pressure fighting began to win him the fight. For the remainder of the bout, De Alba mostly pressed Esquilin to the ropes and swung away. With his back pressed against the ropes, Smurf still stayed in the fight by landing clean, hard shots, but De Alba was landing more. The fifth was De Alba's clearest and best round, with Esquilin looking sapped. However, the Philadelphian made a final stand in the sixth round, swinging for the fences as the last bell neared. De Alba, however, remained out of trouble. All three judges scored the fight for De Alba, 58-56 (Braswell) and 59-55 twice (Hill and Rubenstein). My score was also 59-55. De Alba improved to 9-1-2, 3 KOs, while Esquilin slid to 2-6-1, no KOs. 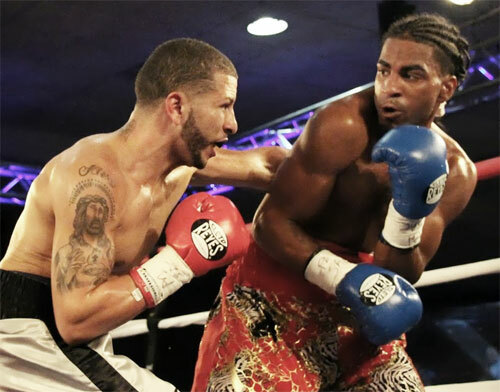 North Philly's Miguel Cartagena remained undefeated with a solid but flawed win over Eduardo Melendez of Puerto Rico, in their 4-round bantamweight fight. Cartagena came out strong, brushed off a five-inch disadvantage in height, and rocked Melendez with series of hard left hooks to the head. 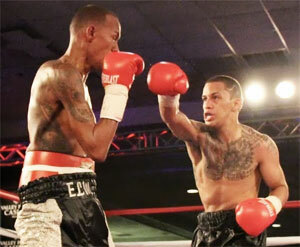 However, just when it seemed that Miguel would steamroll his foe, Melendez whacked Cartagena with a stiff right hand. Miguel wasn't hurt, but the shot made him take notice. The surprising punch lit a fire under Cartagena that almost burned out of control. He fought the rest of the night in a rage. Later in round one, Melendez landed hard again, this time with a left hook. Cartagena pawed at his right eye, blinked, and waged in with another fury. Melendez squeaked out the second round with his long jab and Cartagena's suddenly reckless style. However, Cartagena won the remainder of the fight. But the talented fighter was wild the rest of the way. Cartagena, who was a world-class amateur and remains a likely bet to become a world champion as a pro, let his hot head get the best of him against Melendez, and looked far less experienced and effective than usual. Clearly he wanted to win, and win big, but lost sight of the overall goal. Given his height, reach, and tricky switch-hitting style, Melendez was a difficult nut to crack, but it was clear early on that Miguel had the power to stop him. If it wasn't for his anger, he might have done it. Although it was good to see Cartagena's feisty fighting spirit, Miguel is a much better fighter than that anger allowed him to display. 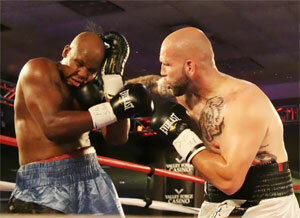 Judges Hill and Braswell scored it 39-37, and Rubenstein had it 40-36, all for Miguel. Cartagena went to 8-0, 3 KOs. Melendez fell to 4-14, 1 KO. 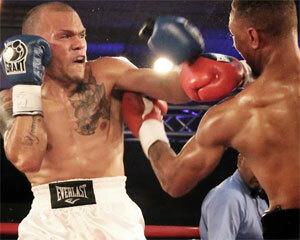 Philly lightweight Damon Allen also had a difficult evening in his four rounder against Sammy Omar Quinones. 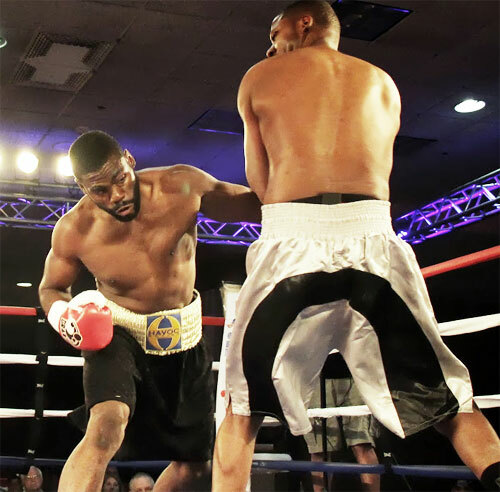 The York, PA fighter repeatedly landed solidly on Allen and gave him a very good test. Allen handled the rough treatment in stride, scoring well with his right, his left hook, and showed an especially good body attack. It was a good learning experience for the young Allen. Even in tough rounds, he found a way to fight back, and won three of the four rounds on my card. However, one or two of the rounds that he won were close, easily making this the toughest of his three pro bouts. Two of the three judges (Rubenstein & Braswell) gave Allen all four rounds, scoring 40-36 . Hill agreed with my 39-37 card. Allen remained undefeated 3-0, 1 KO. Quinones evened out at 2-2, 1 KO. 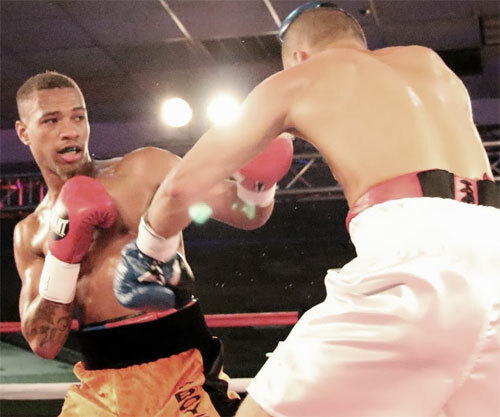 In the opening bout of the night, Philadelphian Khalib Whitmore won his second straight fight by quickly knocking out Richard McCoombs of Washington, DC. Whitmore, 2-0, 1 KO, stormed out at the opening and immediately began landing. Right off the bat, a heavy barrage dropped McCoombs. When McCoombs regained his feet, southpaw Whitmore refused to let him off the hook. A left hand hurt McCoombs, as did a follow up body blow. Finally a soft right convinced him to again fall to the canvas. He struggled to his feet, and made it up by referee Blair Talmadge's count of 10, but the ref waved the fight over. 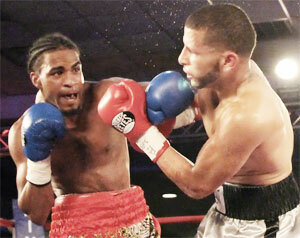 A crowd of about 700 came out to this the third installment of the Kings Boxing Valley Forge series. The main event was to have been a 10-rounder for the PA State lightweight title between champion Naim Nelson and Ryan Belasco. However, a hand injury suffered by Nelson during training forced the fight to be scrapped, allowing Promoter Marshall Kauffman's son Travis to slip into the spotlight bout.